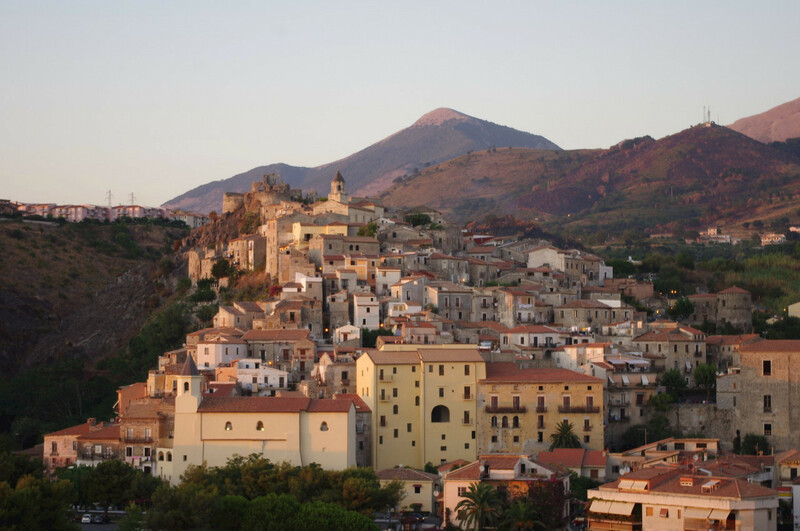 It is no secret that Calabria is the new rock star in the Italian dream destination line up. Seasoned tourists who have seen the Italian trifecta (Rome, Florence and Venice) are coming back for more and are insisting on off the beaten path, immersive Italian experiences. They do not want more lines, more high prices and more plaster of Paris replicas of the Leaning Tower and the Statue of David. August is when Italians take their vacations and any big Italian city in August can be a bit, well, almost ghostly. Shops are shuttered, and local restaurants are almost empty. 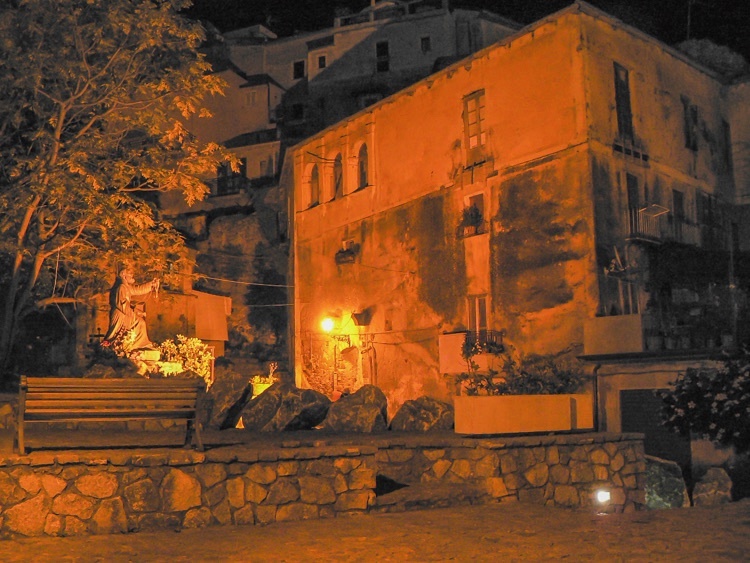 And the answer is one little resort town in Calabria, Scalea! Every August, Italian cities empty out and seemingly all of Italy heads down to Scalea and the surrounding area. The Italians and many Northern Europeans have known about Scalea forever. Ask an Italian about Scalea and they will have heard of it and probably been there with stories of sweet nostalgia. But ask a tour guide or even a famous guide book writer (as I did) and you might get the idea that tourists don’t go to Southern Italy, especially not American tourists. And my dear that is where they are WRONG!!!! In 2011, my husband and I discovered Calabria close up and personal. We loved it so much we bought a place there and have never looked back. So if you are looking for the perfect place to put your toes in the crisp, blue Mediterranean, look no further. Scalea has so many things going for it. This is only a short list. 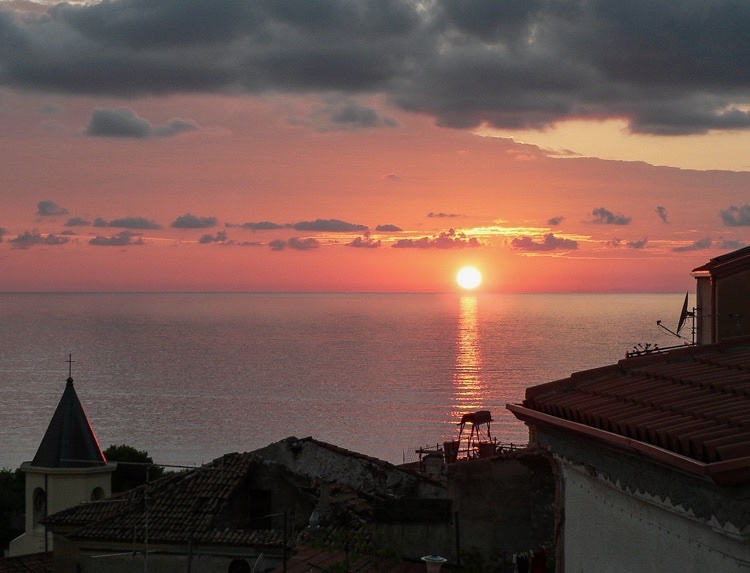 Calabria is finally taking her place as a top tourist destination but her beautiful beaches have existed here forever. Europeans have long known about Calabria’s spectacular stretches of azure coastline and now the rest of the world is starting to discover them as well. Scalea boasts of miles of beautiful beaches dotted with bright umbrellas and loungers beckoning you. For a few euros, rent an umbrella and spend the afternoon dozing on your lounger or bobbing in the sea. 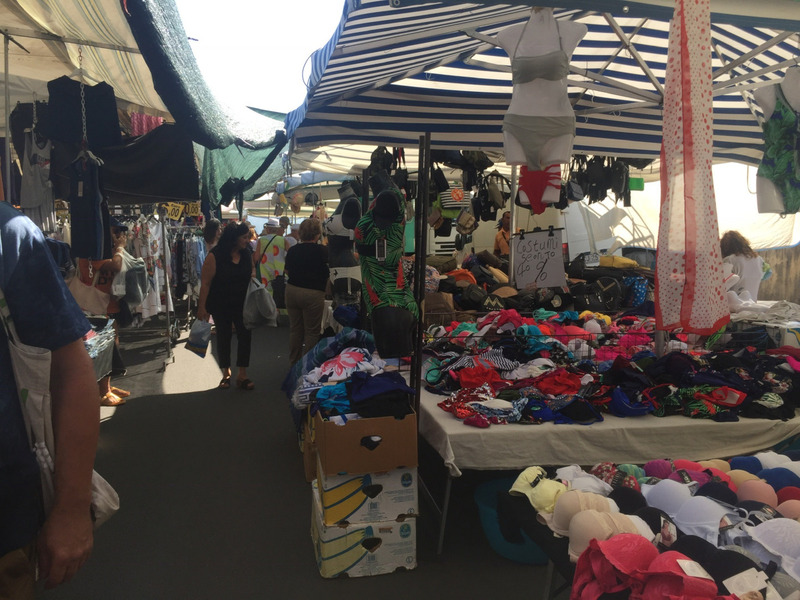 When you get hungry, grab a snack at one of the lidos and in summer, shop for sunglasses, dresses and jewellery from the vendors who walk the beaches selling their wares. Watch the families looking for sea urchin in the shallows and collecting them in their buckets while working on their tans. Since most of the world is only just finding out about Calabria in general and Scalea in particular, the prices are still very low. For example, you can get a perfect wood fired pizza for about 8 euros. Everything from food, to clothing to perfect coffees in the bars and cafes cost next to nothing so vacations there will not break the bank. Scalea is a seaside resort and fishing is still a big part of the cuisine and the local economy. 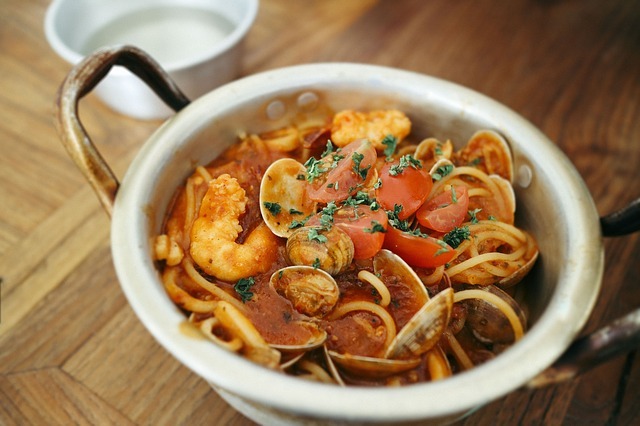 When you order a seafood dish in a local restaurant, you know it has been pulled from the Mediterranean shortly before it appeared on your plate. 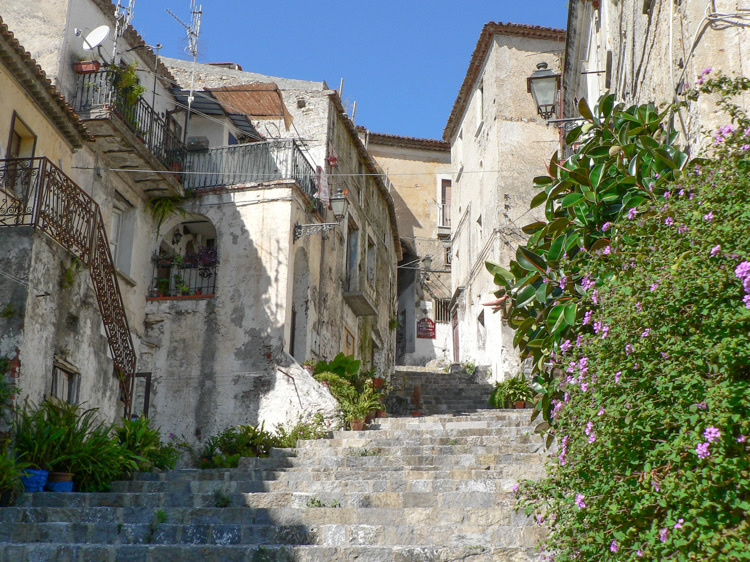 Scalea is an area where you can also get cinghiale, the wild boar that roam the nearby hills. Recently we had a fantastic meal cooked by a neighbor. When pressed as to where one buys cinghiale, the answer was a vague “We get it from friends”. Pastas in the restaurants are hand made daily. Pastries are crafted starting from the wee hours of the morning. Recipes that exist only in the memories of mammas and nonnas are revisited every week as the food crafters of Southern Italy create their magic over and over. If you are very lucky, you might get invited to a Sunday lunch. If you do, GO! It is something you will never forget. Recently a new supermarket was established in Scalea which has aisles and aisles of anything you might need including wines from everywhere. There are so many wines from Southern Italy and from what I can tell, they are all pretty good however the BEST wine is in the family owned restaurants because these wines, like everything else they serve, are hand crafted following old family recipes. As my friend Michelle who owns the Bella Vista restaurant proudly proclaims, it is “tutto naturale” All natural and no artificial anything. As a result you get a super smooth, deliciously light wine that is perfectly balanced and does not overpower any dish. You also avoid the morning after headache if you are sensitive to artificial ingredients. Recently my husband and I purchased a couple of properties in the area surrounding Scalea as BNB rentals. One we are renovating in our village of Santa Domenica Talao. The other we purchased as a finished apartment in Praia a Mare overlooking the Gulf of Policastro and Dino island. When you look online for accommodation you see that the prices in Scalea and nearby are dramatically different than those up North. You can also see that the sea and mountain views are everywhere. You pay marginally more for a room with a view but nothing like you would anywhere else. And there is nothing like climbing out of bed and walking onto a terrace to see the sweeping blanket of blue sea stretching out to the horizon. If you are in the market for a home overlooking the Mediterranean, now is the time to buy. There was boom when we were first looking in 2011 but this boom has ended and with the political uncertainties in Europe, more and more properties have come on the market resulting in a glut and a total buyer’s market for anything from large villas to small apartments. If you want to own your own piece of paradise, it is totally doable. In my village you can purchase a renovation project for 12,000 euros or the apartment which is habitable and is just next door to us, for 35,000 euros. Recently I have been working with our village architect on helping Americans purchase properties in our village. It is easier than you think. All year long there are various festivals as the Calabrians seem to look for reasons to celebrate life and being together. My favorite is the Madonna festival which happens in Scalea mid July. The entire town turns out to celebrate the Madonna who emerges from her church at the top of the Centro Storico (Historical center) carried by loyal parishioners and followed by a procession of people with hand crafted, beautiful baskets on their heads. The baskets are very ornate and obviously those carrying them spend a lot of time coming up with the designs and decorating them. The procession winds its way all through Scalea to each church. As the Madonna arrives at another Church fireworks are set off letting everyone know where she is. Meanwhile streets are blocked off for “paintings” created from colored wood chips by local artists. Elsewhere people set off Chinese lanterns and watch them drift out over the sea, vendors sell anything from cheese to produce, to toys, books and pictures. And the entire town celebrates together. Finally, around midnight, the Madonna and her exhausted crew reach the sea and the final round of fireworks emerges letting everyone know she arrived. The festivities carry on long into the night and it is the most fun and exciting festival I have experienced. No matter who you are, if you are there you are a part of it. All through the year there are pastry festivals, pepper festivals, Saint festivals, and festivals for any kind of food. Each one is different and tons of fun. The Monday market in Scalea is one of my favorite things. True, you can hit up the fruit and veg market any day and trucks with freshly picked produce of all kinds always line the streets. But the big market in Scalea happens once a week. Anything you need is available at the Monday market and it is usually very inexpensive. You do have to be somewhat watchful as my husband found out. He purchased some bright green sheets and did not wash them a hundred times before putting them on the bed. The next day he woke up looking like an alien. Let’s not even talk about the time I washed my bright yellow dress with his underwear turning everything bright yellow and causing comment for him at the gym. That said, I love the shoe stalls, the dress stalls with their super saver one euro tables where you can find some pretty great T- shirts, and I love the jewellery stalls. Every time I go I come back bedecked in unusual costume jewellery that I purchase for a handful of coins. The market is large and colorful and I run into everyone I know there which is another reason I love it. Despite being a popular European tourist destination, this is a family town. 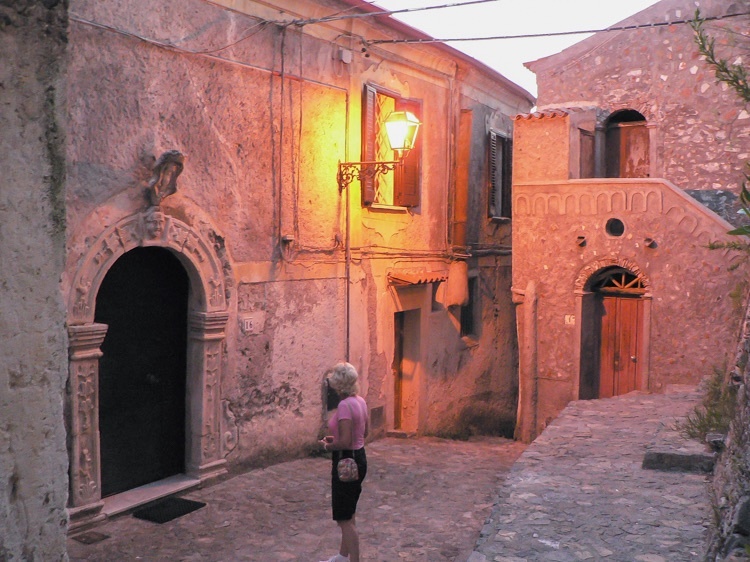 In nice weather, enjoy the passeggiata (Evening walk) in the area pedonale (The area reserved for pedestrians) in Scalea. Families go out together and walk. They meet and chat with neighbors, they have a gelato, they reconnect. The shops are mostly family owned and when you patronize one over time, you become part of the circle of friends and family. 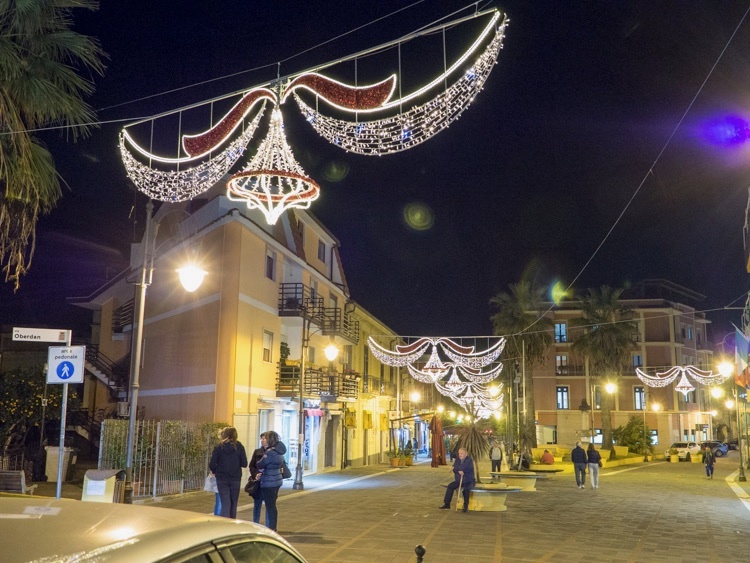 Calabria has never lost that part of its culture and the importance it places on friends and family. Scalea is actually a big, beautiful, quirky family, brightly colored, full of character and life and one that welcomes anyone who wants to be part of it. Scalea is not just a tourist destination, it is an experience and it is not to be missed. 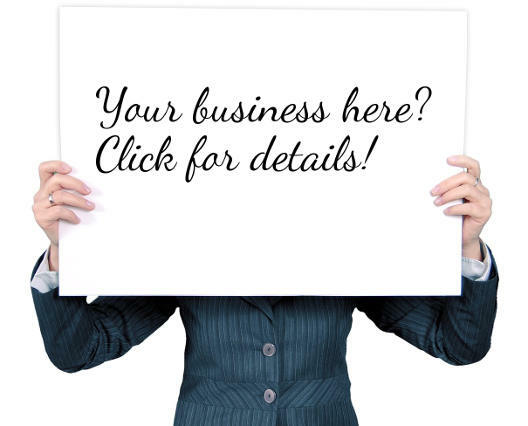 Chris Ellis-Sobolev is a travel professional and a blogger. Italy is her passion and her home for more and more of each year. 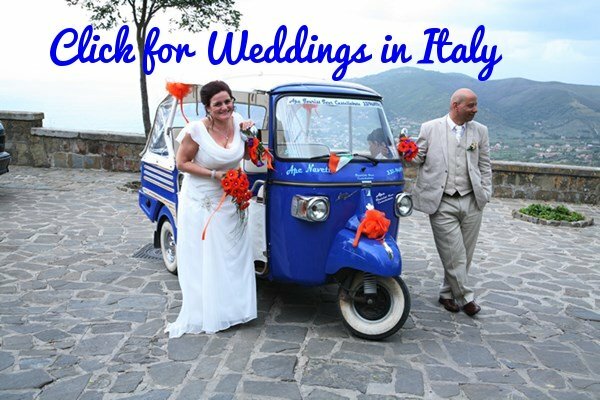 When not in Italy you'll find Chris and husband Pete in California planning their next trip to their home in Santa Domenica Talao, Calabria. 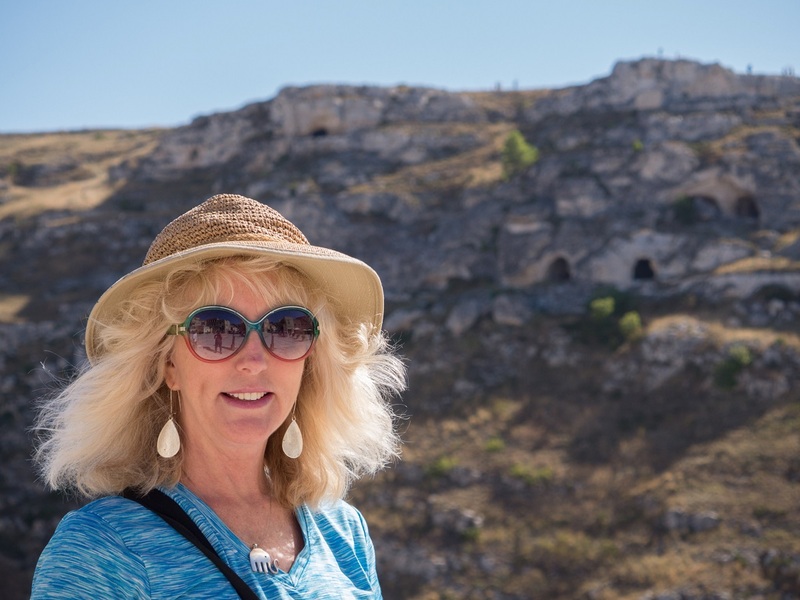 Chris has shared many of her articles on travel websites and her popular article on how she found home in Santa Domenica Talao is published on MiOMyItaly.com. Her book Chasing La Bella Vita is available on amazon.com. Meet Chris and Pete on their website at supersavvytravelers.com.